Durian season comes only twice a year but when it does it generates much excitement among Southeast Asians. While the strong smell may drive some people away, the taste can bring you to a higher dimension. Just ask the converts. It is used in a variety of recipes, including rice dishes and curry. Durian is called the king of fruits and is found only in Southeast Asia. 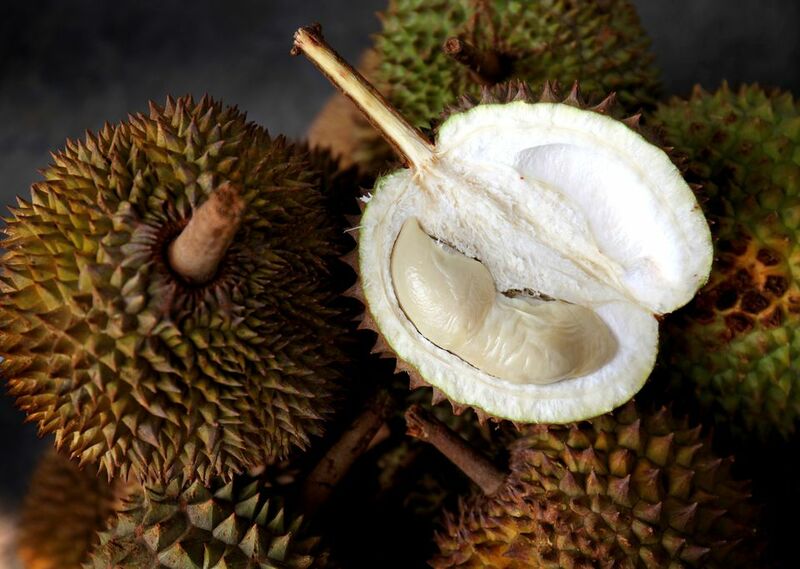 Durians possess yin-yang qualities—it can be like a porcupine keeping prey away with its sharp thorns; on the other hand, its delicious flesh contains lots of vitamins and minerals. It is important to know how to choose the right durian. If it is too ripe, it may be overly bitter and pungent. If it is not ripe enough, the flesh will be hard and probably tasteless. Although most of the durians found in the West are imported frozen, the following techniques for finding the perfect fruit will still apply. It is a subtle art that involves smell, hearing, and touch. Assuming that the durian is not frozen, the first thing that you should do is pick the durian up in both your palms. Do this gently, and if the thorns hurt, use a couple of tea towels to protect your hands. Place the durian next to your ear, and give it a gentle shake, not unlike shaking maracas to some soul music. If there is no sound, it means that the fruit is too ripe. If there is a hard knocking sound, the fruit is not ripe enough. What you want to hear are dull, subtle knocks. After identifying the right knocking sounds, you want to narrow your choice down further with the right smell. Put the durian about an inch from your nose. Take a whiff. Can you smell the slightly fragrant odor? If it smells raw, like unripe fruit, then the durian is probably not ripe. If the smell is strong and over-powering, it is probably too ripe, and the flesh is likely to be soft and gooey. It should smell just so—neither too raw nor too strong. Once you have picked the perfect durian, it’s time to open it up. If you look carefully at the base of the fruit, you will see faint brownish outlines of a 5-pointed star. These are the durian’s sutures or the lines that separate its different segments. Follow these lines, and you will find it a breeze to split open a durian. Get a knife with a strong and sharp point to open up the durian. Using a piece of cloth, hold the durian with one hand. With the knife in the other, poke straight into the middle of the “star.” Once the knife has penetrated the durian by about 2 inches, twist the knife left and right a few times. The sutures or the lines of the different segments should open up. Cut through the durian along these lines. As the durian opens by another few inches, use your hands to pull apart the durian segments. It may be a good idea to protect your hands from the thorns with some cloth. Your durian is now ready to be eaten. Just eat the flesh of the durian and discard the seeds. Can you spot the durian segment in the upper right-hand corner of the picture? The brown discoloration is an indication that it has been attacked by little worms. Even so, the rest of the segments are intact, and the fruits from this durian are delicious. So, do not write off a durian that has slight irregularities. Some people believe that they are more likely to be pesticide free. What if the Durians are already Pre-packed? Sometimes we do not have the opportunity to buy whole durians. There are similar ways to test packaged durians but remember; you can only do this with the unfrozen variety. Use one of your fingers and very lightly and gently glide over the surface of the yellow flesh. You do not want to use too much force which may bruise the fruit. If the flesh feels tender and soft, then the fruit is ready. If it feels hard to the touch, then that part of the fruit is unripe. If it yields too quickly, it is too ripe. Next, apply the smell test described above, only this time bring the package, rather than the whole fruit, up to your nose. If it smells raw, then it is probably not sufficiently ripe. If the smell is too strong and over-powering, it is likely to be too ripe. It should smell somewhere in between. Note: the frozen variety will probably have a milder fragrance. Durians will keep well for one or two days in an airtight container in the fridge. Try to use a flat container and avoid stacking the seeds one on top of another. You may also keep them in a container suitable for freezing. They will keep well in a freezer for up to two months. If you want to learn how to make a 100% all natural durian ice-cream, please click here.